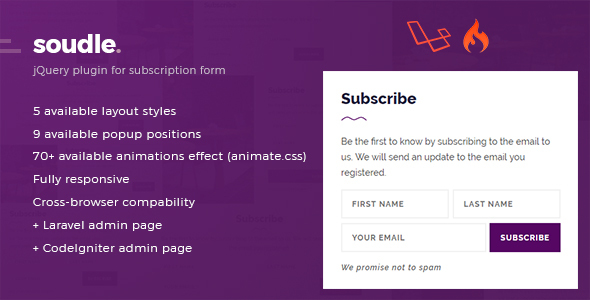 Soudle.js – jQuery Plugin for Subscription Form Created by frameborder. This templates have specific characteristics, namely: Soudle.js has features such as High Resolution: No, Compatible Browsers: IE11, Firefox, Safari, Opera, Chrome, Edge, Software Version: jQuery . Soudle.js is a jQuery plugin to create subscription forms. Soudle has 2 types of subscription form that is ‘inline’ and ‘popup’. With soudle you can make subscription form easier, just by importing all required files then define soudle by yourself. Thanks to the amazing library used in this plugin.